The chapel at the Hostert ceme­tery can be con­sid­ered as the old­est build­ing of the region. 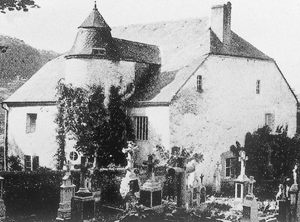 This old house of God prob­a­bly exist­ed already in the 14th cen­tu­ry and belonged to the rur­al prop­er­ty of the Earls of Lux­em­bourg. Sanc­ti­fied to St.John it served as the parish church in the begin­ning. 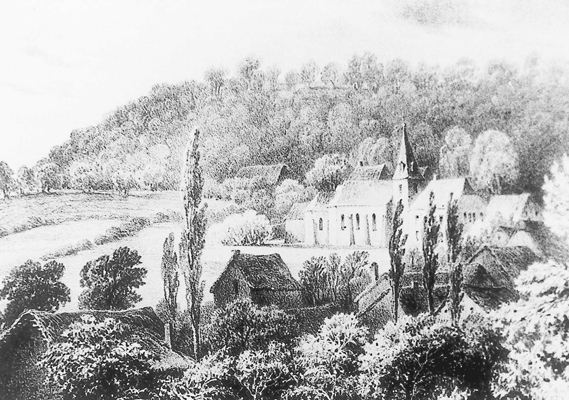 In 1686 and 1728, after impor­tant enlarge­ments, the build­ing served for a long time as choir of the new church wing, annexed on the west side. 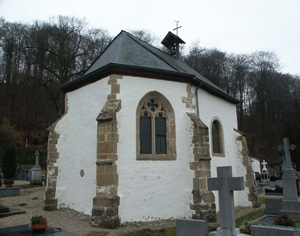 This was the foun­da­tion of the “old” Hostert church, which also had a crypt and a tow­er at its the front side. In 1860, after that the parish did move to the “New Quar­ter” church, the choir and the tow­er had been knocked down. The left choir served from then as the ceme­tery chapel and had been clas­si­fied his­tor­i­cal mon­u­ment in the year 1976. Today the chapel still serves as mor­tu­ary chapel. The polyg­o­nal con­struc­tion with its huge piers shows two roman and two goth­ic arched win­dows. The large arch of the entrance, where once the old nave was attached, had been closed up with mason­ry and a door. Inside you can find a stat­ue of St.Sebastian, St.Barbara and of St. Cyr­i­ac. Last had been wor­shiped since the 18th cen­tu­ry in Hostert and its region and had been declared in 1714 the sec­ond patron saint of the house of God. Cyr­i­ac, dea­con of the roman church at the times of he popes Mar­celli­nus and Mar­cel­lus, died of mar­tyr­dom in 303 under the reign of the roman emper­or Dio­clet­ian. He belongs to the 14 saints, helpers in need and is called for rheuma­tism. At his annu­al cel­e­bra­tion, the stat­ue of St.Cyriac is car­ried through Hostert and Ober­an­ven to be brought to the parish church. The old vic­arage was stand­ing on the site of the Hostert ceme­tery until 1969. This ini­tial “Hostert farm” , con­struct­ed by the knights and mas­ters of Esch, in the mid­dle of the 13th cen­tu­ry, had been trans­formed and ren­o­vat­ed many times dur­ing the years and prob­a­bly only at the 16th cen­tu­ry it did receive its final form. The 2-floor cubic build­ing with its tow­er on the east side had been annexed to the old parish church with its west side. 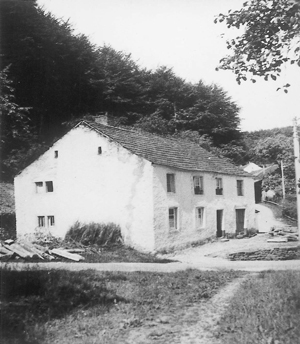 Once the chaplain’s house was the first to be con­struct­ed so close to the spring meet­ing point of the sources at the right side of the old vic­arage court. Built in 1812 to serve as the town­hall, the “Pin­nels House” was used for the chaplain’s dwelling and some­times also for school pur­pos­es. The very sober and sim­ple build­ing had one floor and a sad­dle­back roof. In 1872 the house was sold by auc­tion and became pri­vate prop­er­ty to re-become munic­i­pal prop­er­ty again lat­er on. 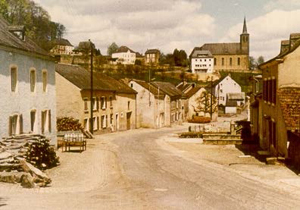 The munic­i­pal author­i­ties ordered its demo­li­tion in 1967, in order to enlarge the pass­ing road.